Acute groin injuries and chronic groin pain are quite frequent among athletes and active people. Nowadays the diagnosis of hip tendinopathies became easy and accurate with the improvement of the imaging techniques. Acute groin injuries occur in high-intensity sports, and adductor injuries account for the majority of these. Iliopsoas and proximal rectus femoris injuries are also common. In the presence of chronic groin pain, the index cause may be a hip joint pathology, such as femoroacetabular impingement (FAI), labral tears or osteoarthritis, but secondary tendinopathies are often present. Conservative therapy is the most recommended treatment and in the past open surgery was indicated only in recalcitrant cases. In the last decade regenerative medicine and endoscopic surgical procedures have greatly expanded the indication for minimally invasive treatments. 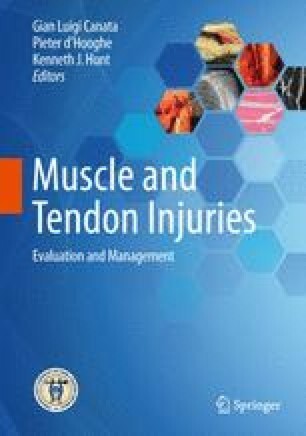 In this chapter, muscles and tendons pathologies have been divided into four groups, according to the different anatomical areas around the hip: medial, anterior, lateral and posterior.